This solution parameterizes an object and appends it to an url in a smart way (by adding a question mark or an ampersand depending on the situation). The first argument is result, it is a enumeration with three alternatives: cancel, invalid and OK.
Then we get the hidden html element and pass it as options to Modal Dialog, provide a callback (cb). Pay attention to clone function. You must copy your div in order to use it more than one time. Therefore we have refine the selection of the input: $(this).siblings(‘.todo-text’), otherwise wrong input is selected. A tip for further reading: SharePoint Development blog. If some values shown on the page must be refreshed, just invoke RefreshPage, like Tobias Lekman suggests. 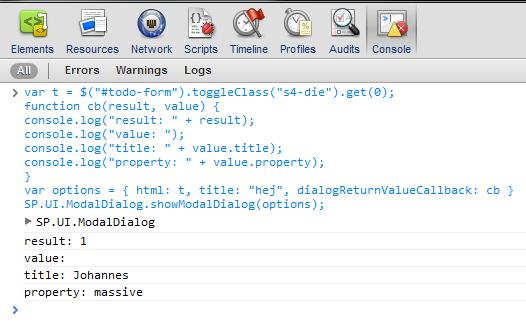 In options you pass to SP.UI.ModalDialog.showModalDialog you can define args property. It can be any object with any complexity.